BOOK A VILLA AT SANTORINI NOW! Fronted by its own stretch of beach & located in Mozambique’s coastal town of Vilanculos, the impressive white buildings of Santorini Mozambique immediately evoke images of a relaxed & pampered beach holiday. 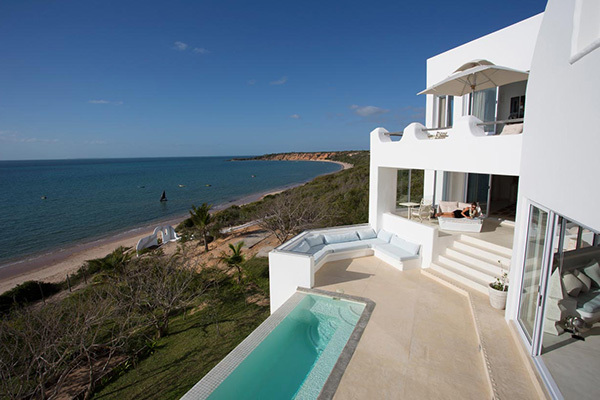 Comprising the original elegant villa, the romantic Chapel & the newest edition – Villa da Praia. Complete with all conveniences & with the option of included activities & watersports, there is something for everyone. “This is a place and space where the rhythm of the tides marks the time and a world of natural beauty fills the pauses”. 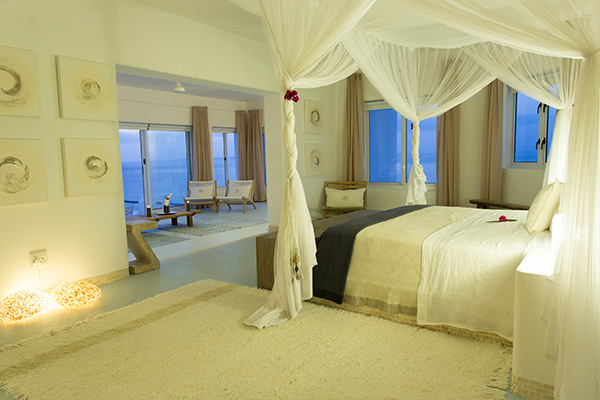 Villa Santorini has 5 sea-view rooms, en-suite & with private patios. The elegant interiors echo the space and flow of the natural surrounds. The 5 en-suite bedrooms can accommodate 10 adults or alternatively 8 adults and 6 children. All rooms are equipped with Wifi, I pod docking stations, a private room safe, elegant en-suite bathrooms, air conditioning and fans. Guests have access to a blue martini pool which directly overlooks the sea. 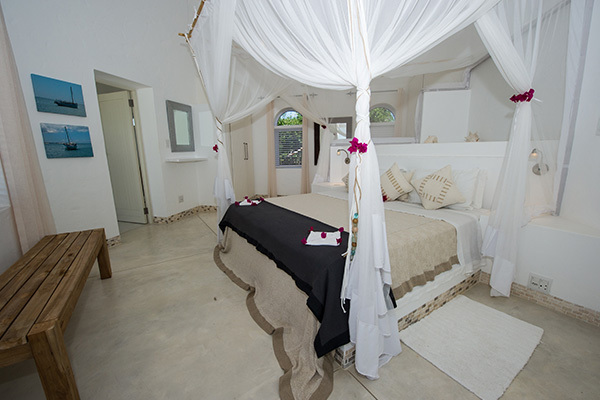 The Chapel at Villa Santorini is a one en-suite bedroom ocean-facing villa with an open plan lounge, kitchen and dining room, making it ideal for honeymoon couples or romantic getaways. A private martini pool and outdoor dining area make the setting complete, and make it the perfect luxury escape, tailor-made to your requirement. Villa da Praia is a three bedroom villa with breathtaking views, ideal for couples sharing or families travelling with children. It is ocean facing with its own lounge, kitchen and dining room. All the bedrooms have en-suite bathrooms with private patios in suites one and two. Two of the suites can be used for children or converted into a twin/king size bed as required. A private infinity pool (solar heated in winter) and outdoor dining area with barbecue are situated on the ocean facing patio. A private host will be available for drinks and meals services throughout your stay. Undoubtedly Villa Da Praia offers the ultimate beach villa experience with exceptional privacy and the Santorini signature luxury “home away from home” experience. Sole use rates will apply to bookings of 4 adults or 2 adults traveling with 2 children of any age. Additional adults and/or children will be charged an additional rate per person per night. • A fully equipped kitchen used for food preparation by our local chefs. • A DVD player with selection of DVD’s.